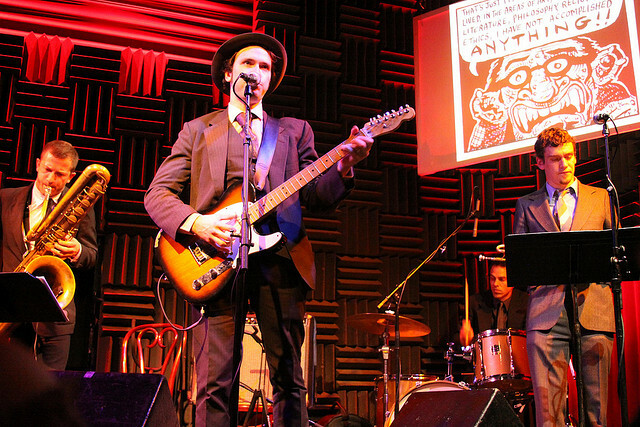 Conceived, programmed and produced an evening of music, media and literature at Joe’s Pub entitled “Eli Valley vs the Sway Machinery in the Temple of Self Hatred”. The event featured a multimedia collaboration between musician Jeremiah Lockwood (The Sway Machinery) and political cartoonist Eli Valley with special guests Alicia Jo Rabins’ Girls In Trouble and author Irina Reyn for The Foundation for Jewish Culture and The Jewish Daily Forward. Eli Valley, maker of mind-bending comics, teams up with Jeremiah Lockwood and The Sway Machinery, makers of mind-bending melodies, for an evening of neurotic superheroes, paranoid turtles, memories, music and mayhem. Valley’s work has brought back a marauding sensibility to The Forward, the landmark Jewish newspaper formed in 1897 as a bulwark of secular Jewish culture in America. The Sway Machinery has reinvented and reinvigorated cantorial melodies for a post-punk age. Together, they play off each other like a rabbi and cantor of a synagogue on the other side of sanity. Watch them mix and mash styles, share personal stories and narrate comics to a live, avant-semitic soundtrack, bringing a kinetic new spin to contemporary Jewish culture. Goldberg Prize winner Irina Reyn’s debut novel is a contemporary retelling of Leo Tolstoy’s classic novel Anna Karenina. Set among early 21st-century Russian Jewish immigrants in New York City, Reyn beautifully adapts Anna Karenina’s social melodrama for a decidedly different set of Russians.